On Friday, Kent Griswold of tinyhouseblog.com posted a few pictures of our house along with a short write-up from me. I am astounded at the response this post has generated on our blog. Before he featured us, we had about 4,500 all-time hits, now we are at 21,000, just two days later. Thank you, Kent and tinyhouseblog. Welcome to our new visitors, and thanks to our friends and family who have encouraged us to share our story. We hope you find encouragement through our story to live life YOUR way. It is a new experience for us to open our lives to such a public arena. Opening our choices to public scrutiny makes me feel quite vulnerable, but also powerful. I am happy to know I am doing my best and living my life by my own internal compass. The kids were fired up! It was fun to see their desire to write a response. I appreciate you taking the time to voice your concerns for children. I, too, am a teacher (public school) who has concern for children as the future leaders of our world. Your comment brought up a fun breakfast table discussion and a passionate response from Ella and Archer, who have composed their own responses to your concerns (below). 1)We do not live remotely–we live in a rural environment. Our land (3 acres) is 1 mile from school and 2 miles from town. 2)Our children are not home-schooled (though I’ve considered it). They are successful students in public school. 3)Our children have lots of friends and regular playdates (at the tiny house and at friends’ houses). 4)The tiny house is a step in a long-term plan. We have made a conscious decision to stay mortgage-free. We are saving as we go, with our final goal being a house (about 1,000 sq. ft.), so that we can each have a small room for our own creative endeavors. In the end, what we will have taught (and are teaching) our children is that one does not have to buy into the cultural belief that a house has to be a certain size, and one must own certain things for happiness. We will have taught them that to reach a goal, one needs a solid plan and the ability to sacrifice desires in order to fulfill REAL needs. We will have taught them that a life without debt means true freedom. I wish you nothing but the best. This is a real option, with so many lessons and joys. There are obviously people ready to judge the decision to go against the mainstream, but as you will read from our kids’ passionate responses below, this choice has been a blessing to our family. We encourage you to go for it! Being mortgage-free is worth the sacrifices and challenges, and you can keep saving and build a bigger house if you feel the need for more space. Living in this tiny house doesn’t affect me in a bad way. We play outside a lot. I have a lot of friends. They even come over for playdates, and we have fun in the woods. Living in a tiny house affects us in a good way. Every Saturday and Sunday, we play imaginary games outside. We have great adventures with our neighbor friends. They don’t even need an invitation to come over! Last week, we all went sledding together. My mom and dad are not evil scientists and would never experiment on me. Don’t judge a book by its cover. 1) TVs take away your privilege to go outside. 2) We have learned to get along and communicate with each other a lot better. 3) We can live in a small space and still have a good life. Well, you handled that really well and for the record, Your children are both creative and amazing….they will both be leaders in one way or another when they grow up. I know for a fact that you are doing what you feel is right for your family. That is the best that we can offer our children any day. We all do what we can. We love you guys. Thanks, Amy! We love you. I agree–well handled. presumably, the person who criticized was imagining something terrible that had nothing to do with your way of life. However, there is nothing wrong with home schooling, if you do it right! I agree! We have a few friends who have chosen home schooling. The kids are happy, creative, well adjusted and well educated. I, for one, really appreciate you guys being willing to be public about your life. My husband and I live in NE Georgia and have been seriously looking at building a tiny house, but our biggest reserve is that we want kids in the next 5 years – and likely won’t have a tiny house built for a couple years. There isn’t much info available on people living on such a scale with children (a search of tiny house living with children usually brings up people referring to living in ~1000 square foot houses – that is not very helpful for our uses.) Thanks for a peek into the kids perspective on tiny living – it definitely makes tiny house living with a family look less daunting when it is just as enjoyable for them as living in a more ‘normal’ home. In some ways, it’s more adventurous and creative! Hello. I saw your house on the Tiny House website. The interior is beautifully done. I’m considering building a small house on a trailer frame. I’m a bit concerned about regulations. How tall is your home? I live in Florida and am wondering if I would have problems with the building department. Any advice would be great. Thank you for sharing your home. The maximum legal size (as I recall) in order to tow without a permit is 8’wide and 13.5′ tall. No problems with the building department, as this is a tagged trailer and not under jurisdiction of the building department, rather the DMV. Be sure the trailer you buy has a title. Some states won’t tag a trailer without a title. I found you from the tiny house blog website, too! I just love your story. My husband and 3-year-old little girl and I share a rather large house – but I would love to downsize one day. Over the last year or so I’ve been methodically decluttering and the more I get rid of, the happier I feel. Our house is beautiful, and we are blessed, but it is a lot of house (and land) to maintain. I can see why you love your little house and I look forward to reading more from you and your wonderful family. Kudos to you and your family for standing up for what you believe in and embracing a life that is different from the mainstream! Hello, just saw you on the Tiny House Blog. I just wanted to say that your story is very inspiring to me. I am also part of a family of four (two daughters 4 and 8) and I dream of living in a tiny house but haven’t found much in terms of other families who are doing it. Now I see that it can indeed be done, and done well! Thank you so much for sharing. I hope you will post more, especially about some of the construction details. I am interested in your dimensions and a drawing of the exact layout would be great to see. I know it is built on a trailer, but is your house easily move-able if you wanted to move it? I have tons of questions, but for now I suppose it is enough to know you exist and to think more about my own family’s possibilities. We don’t have plans to move the tiny house, but it could be done. We would have to move the deck and would need a large tractor (or crane) to pull it up and down the hill. You are welcome! Thank you for reading and commenting. I enjoy sharing our lessons in hopes that our experiences will help others. Enjoy the process of creating your dream. Kudos to brother and sister, wish evry child think the same way, god bless them. I have been facisnated with your lifestyle for months. I would love to also live morgage freeI I I i. I think you all are brilliant to have made the decision to build your own tiny house. I would love to make this venture but my concern is how to get alone time as a couple in such a small space? I guess you can go away for weekends. How do you each find times as individuals and as a couple in a small space? When I need time alone from my husband and daughter I go on a walk, or to the library. What do each of you do? Thanks for reading and commenting! Living mortgage-free is freedom! I highly recommend it. It isn’t easy to find alone time in the tiny house, but we have found solutions. For my solitude and writing time, I get up most days at 5:00am, so that I have quiet time while the family is still asleep. I also write when everyone is away at work and school. I work in the garden. I take walks. The kids struggle with being so close at times, but they find alone time by going into the woods to their hideouts, playing by the creek, climbing trees and escaping into reading. Karl also reads and works outside. We all escape to our lofts if we need to, so that gives us a bit of away space. I’d say the biggest place for alone time is the outdoors. We dug a fire pit right next to our deck, so we have a lot of campfires, which gives our deck the feeling of an outdoor living room. For alone time as a couple, we have one day off together while the kids are at school, we stay up later and get up earlier than the kids, and we have separate lofts. Thanks for your great question and good luck! Thank you. 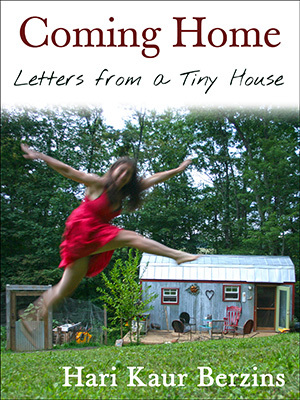 Learning to live gracefully in a tiny space has propelled me into a new state of being. I am happy here. Good luck! Dear Mama Hari – you guys rock! Your family is such an inspiration in a world of excessive consumerism. After the birth of our second child last year, our family went from two high-salary-earning parents to one. Unfortunately, we bought a house several years ago that requires the two salaries (3600 sq. ft, ugh!). The weight of the mortgage is palpable now. After reading about your family, I realized we could easily live on 1/3 of that space and get rid of the mortgage all together! What a relief that would be, especially to my husband who is now feeling the pressure of being the sole bread winner. Anyway, I too have been thinking about homeschooling our kids, and I was wondering if you could elaborate on why you chose not to do so. Did a need for space factor into your decision or was the decision independent of your living situation? Thank you! I’m grateful for the opportunity to inspire. Oh, you could live beautifully in a 1200 sq. ft. home! And without a mortgage–woohoo! You will all breathe a big ole deep breath. I’m so happy for you and your realizations. Good luck on the sale of your house. I thought a lot about homeschooling our kids when they were babies and toddlers. Once they got closer to the school-age, I realized that homeschooling wasn’t for us. This was independent of our living situation, but may have been dependent on our family’s need for me to earn an income to build our home. I realized that my kids needed other input and time away from us. There still may come a time when we homeschool, but the kids are really happy at school. We’ve been blessed with wonderful teachers and caring administration. I’m sure if we weren’t so happy with our school system, we’d reconsider. That said, I do think it’d be quite difficult to homeschool in our tiny house of 168 sq. ft. now 1200 sq. ft.–that’d be possible. I found out about your family and the amazing things you are doing. 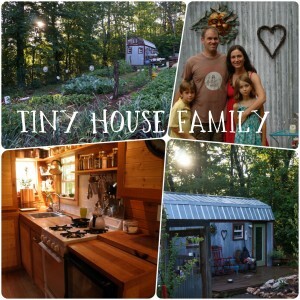 I love the idea of tiny living and was wondering how well it would work with a family of 6. There really isn’t much to read about it with families and children. You will need to find the right-size for your family. I encourage you to build big enough to give each of you a little space for solitude and creativity. You could still build a small home, but make sure it suits your family’s needs. Our 168 sq. ft. home is adequate for our basic needs, but we are looking forward to the space and expanded social life and creativity our big house will provide. Living tiny with a family is possible, for sure–just be sure to consider your lifestyle and include space for what makes you happy. We miss having room to create, room for solitude and room for community (gatherings of friends and family). We moved into our tiny home knowing it was a longer-term “temporary” solution, and it’s a great one! We are in our fourth (and likely last) year of living tiny. The amazing thing is that we’ve made some simple sacrifices to learn a ton about ourselves, our relationships to each other, the land and our stuff, and we’ve been able to build our right-sized home mortgage-free! So living tiny with a family is an awesome way to design and build a lifestyle to fit your family like a glove. We couldn’t be happier with our choice to leave the credit system, and are so grateful for the tiny house’s role in this process. I salute you from a far european country, Romania! You may know that your life experience must be a great and usefull lesson for many people not just from USA, but from the entire world. Keep the good work and have a happy life together! You deserve every minute of joy and happyness! PS Almost forgot to mention that we (a 3 members family) are living in a 37 square meters (398.26 square ft) small apartment in the capital of my country. I discovered your blog when i was searching some new ways to organise small houses, but then i clearly realised that i found here much more that the ideas i was looking for: i found a lesson of life. Congratulations! you are strong people and you live a healthy and precious life there! I will share your story on my Facebook page for my friends and i’m sure that they will love your blog and follow your posts. Hugs from my 7 years daughter to your amazing kids! Thanks for this note. It touched my heart and brought tears to my eyes. I salute you from my rocking chair in the big house. Big hugs!